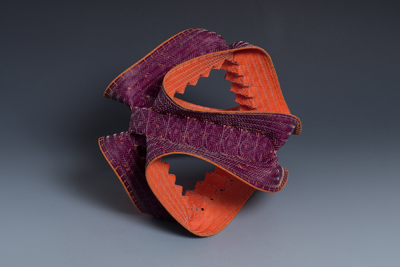 Dorothy McGuinness will have a solo show, “Baskets: More Than Function” at the Phinney Center Gallery in Seattle from June 19th – August 2nd, 2013. Opening reception will be Friday June 21st from 7-9pm. This is a show of sculptural baskets woven with watercolor paper woven in diagonal twills using 3mm strips cut with a pasta maker. The paper is painted before-hand with a variety of acrylic paints.